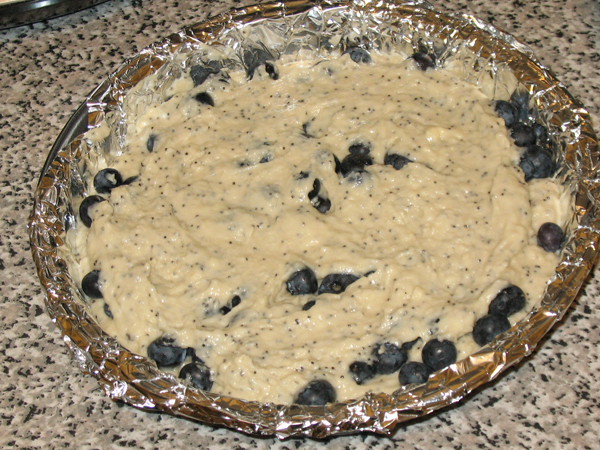 Initially I planned to make a tea bread with a light lemon frosting, but Boyfriend persuaded me to skip the frosting and try blueberry cake as-is. Hmm. Will it be good? This recipe also comes from KitchenAid 3 cookbooks in 1: pies & tarts, cakes & cupcakes; breads, which is available on Amazon.com which has turned out to a good find so far. 1. Pre-heat oven to 176.6°C / 350°F. Line baking pan with foil, and grease. 2. 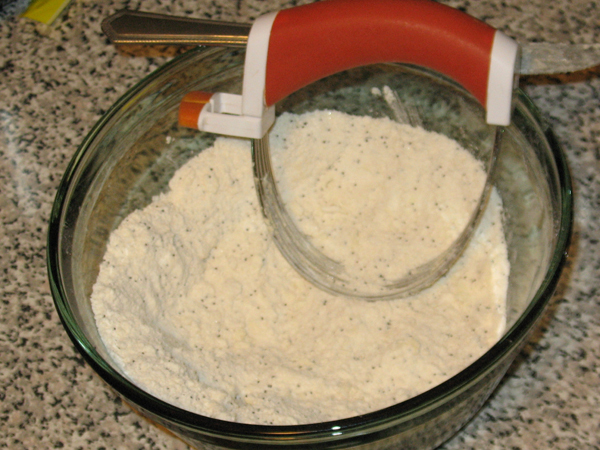 In a large bowl, combine: flour, sugar, baking powder, baking soda, and salt. 3. 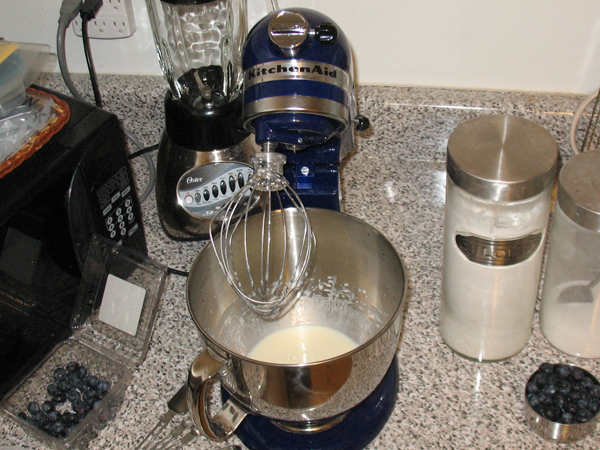 Use pastry blender to cut in butter until coarse crumbs form. 4. 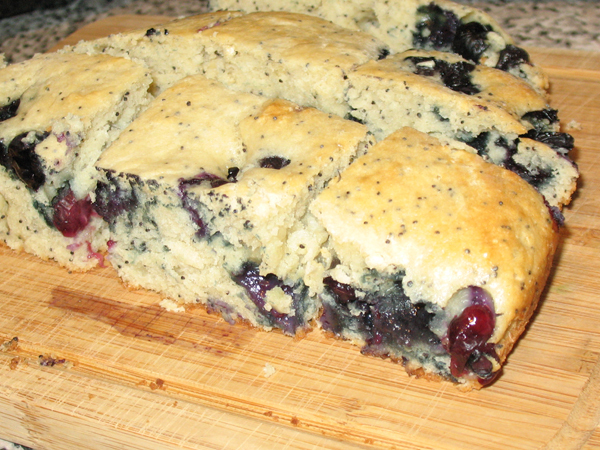 Mix in poppy seeds. 5. 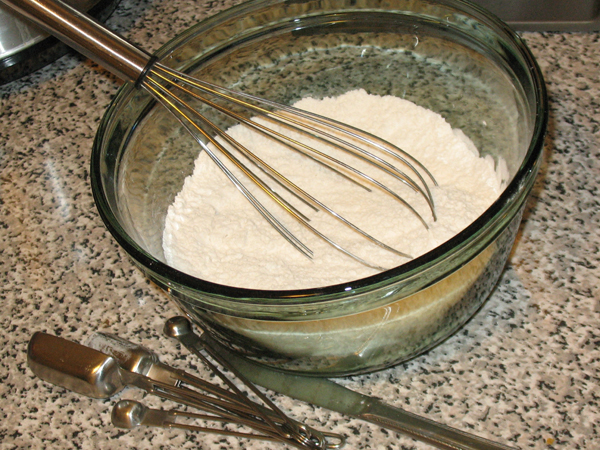 In mixer, whisk eggs, vanilla, buttermilk, and lemon juice. 6. 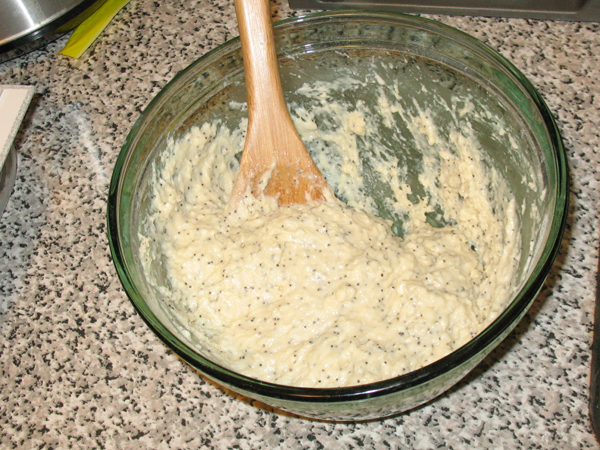 Add wet mixture to dry, until just combined. 7. 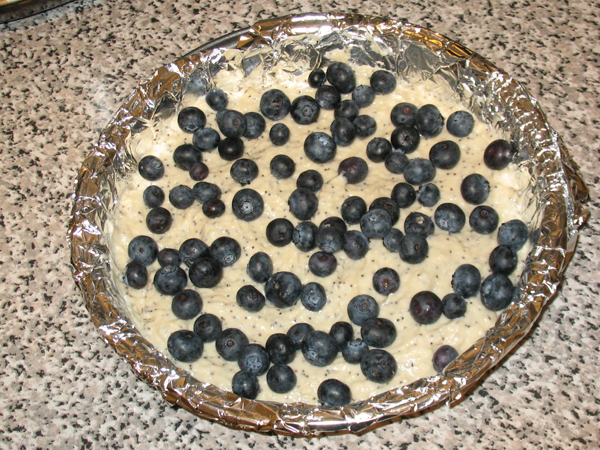 Place half of the batter into prepared pan, then sprinkle berries into batter. 8. 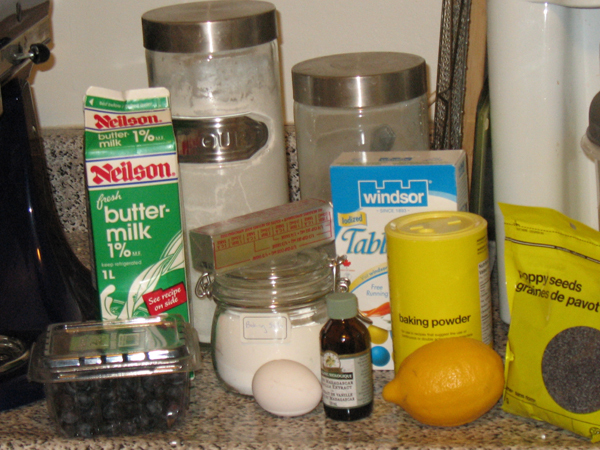 Drop remaining batter onto the berries, and attempt to spread evenly. Leave some berries uncovered. 9. Bake 33 min. 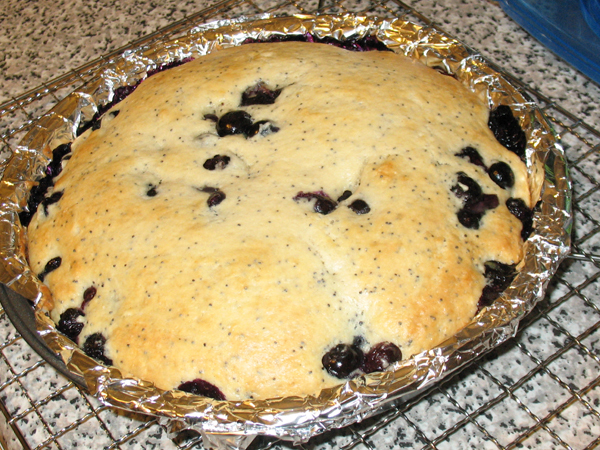 Cool in pan for 2 min after baking, then use tinfoil to lift from pan. 10. Use mad ninja skills to remove tinfoil, and cool at least 15 min before slicing. Now I have almost a litre of buttermilk in the fridge and no idea what else to do with it, so I predict cupcakes are in the near future. 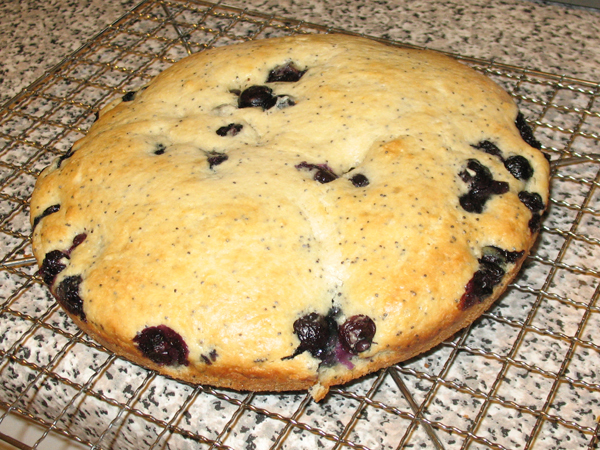 This entry was posted in tea bread and tagged blueberries, books, boyfriend, experiment, food, KitchenAid, recipes, tea bread. WOW – this looks great, very tasty looking. Thanks for sharing. You could make some buttermilk pancakes. Yum yum. I’m a lazy pan cake maker. Hmmm.